Since LinX and IntelBurnTest use outdated binaries of Linpack (Intel Math Kernel Library Benchmarks), I made a small console front-end with the latest build of Linpack (2018.3.011). 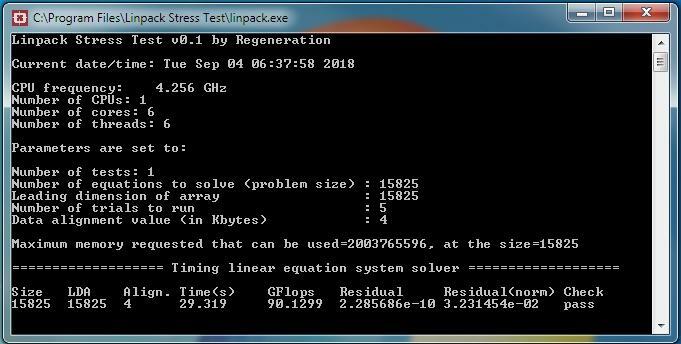 Linpack is the best CPU stress testing software. When used correctly, unstable overclocked systems crash in minutes. 8 hours of Linpack worth 24 hours of Prime95. On Windows 10, it may require to run it as administrator. Linpack Stress Test is a small console front-end with the latest build of Linpack (Intel Math Kernel Library Benchmarks 2018.3.011). Linpack is the ultimate CPU stress testing software available today - best used to test stability of overclocked CPUs. Unstable systems tend to crash in just a matter of minutes by running Linpack. 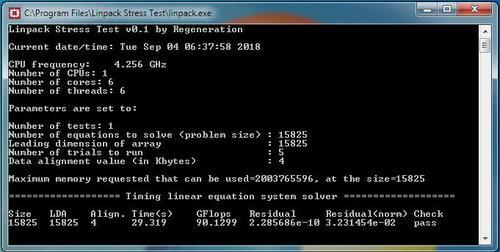 Linpack solves a dense (real*8) system of linear equations (Ax=b), measures the amount of time it takes to factor and solve the system, converts that time into a performance rate, and tests the results for accuracy. The generalization is in the number of equations it can solve, which is not limited to 1000. Linpack uses partial pivoting to assure the accuracy of the results. I created this project because LinX, IntelBurnTest, and OCCT use outdated Linpack binaries. Linpack Stress Test requires administrator privileges (Run as administrator). Make sure to keep an eye on the temperatures as Linpack generates excessive amount of stress.